This is my son's 16th Birthday present. We wanted to get him a ski doo, but he wanted a GSD. I wasn't fond of the idea, I'm a little wary of big dogs, but I think I have fallen in love!!! She is so smart and beautiful. This is Sasha's favorite resting spot! 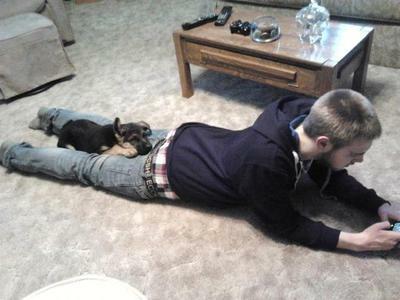 Thank you so much for sending in the picture of your son and his new German Shepherd Puppy. And I absolutely love the picture - such a cute shot! That is amazing that your son turned down a ski do for a German Shepherd Puppy. Wow - then he must have been really serious to make that choice. I wish you all nothing but the best with your new GSD puppy. Sasha is absolutely lovely and she will provide your entire family a lot more love and memories than a ski do ever could. Just remember that they grow up fast so get a lot of pictures. Socialize her completely, keep her up on her shots, take her to every pet friendly place that you can, get her into a puppy class as soon as you can and just enjoy this time - they're only little for a few weeks! You will be amazed at how fast they grow out of that chubby puppy phase. And if you get the chance, tell your friends and family to come by now and visit Sasha's page and maybe even leave a comment. Good luck with Sasha and continued success. GSD's rule! Congratulations on the new edition to the family. Sasha is a Beautiful pup!!! Her name fits her to a T.
Ah, the puppy year, enjoy, this is the most precious time with your new baby, bonding, teaching and training. I love it. Hold her and snuggle her against you, next year she will too big. Take of your little precious Sasha and be careful with her ears too! She will be your Protector!